As an LDS reader of the New Testament, do you find yourself searching for deeper understanding? True comprehension of the New Testament—a book of scripture full of unfamiliar customs, locations, and symbolism—will often require more than just a casual reading. 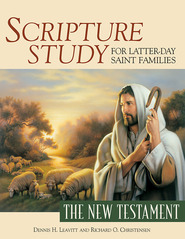 In Scripture Study Made Simple: The New Testament, readers are invited to embark on a comprehensive journey of the birth, life, ministry, and Atonement of Jesus Christ, as well as the teachings of His Apostles after His Resurrection. This volume includes a full publication of the New Testament text alongside a verse-by-verse discussion guide designed to expound on familiar topics and help readers understand and navigate more complex themes and difficult topics. The notes themselves total more than 110,000 words and offer extensive helps for readers and teachers alike. It feels like I am reading a different book than other reviewers. This is a very easy to understand and helpful commentary . Brother Wayment has a skill set that is very unique, he is a true disciple - scholar, Elder Maxwell would say. This book combined with his new traslation of the New Testament are perfect for our study of the New Testament. As an academic trained historian, I recommend this commentary.